The Premiair PD20DEN is a medium capacity dehumidifier designed for home use and will control humidity in a medium to large sized area. In common with most home dehumidifiers this unit uses a refrigeration system to cool a coil inside the dehumidifier on to which water vapour is condensed from the air. 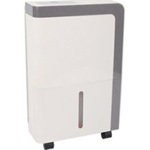 For a unit of its power this dehumidifier is of slim design and reasonably light in weight. The PD20DEN has all of the features commonly found in dehumidifiers for use in the home and is of neat and modern appearance. A useful feature included with this model is an outlet directing the dried air upward to assist with the drying of laundry. The Premiair PD20DEN dehumidifier will control relative humidity in a large room within a home and with its clean, modern styling will not look out of place wherever it is used. For a dehumidifier of its capacity the PD20DEN is a compact unit with a foot-print of only 34.0cm x 23.5cm and standing just 48.0cm in height. Its modest dimensions make it a good choice for anyone looking for a dehumidifier for an area where floor space is limited. In such areas it is frequently necessary to move a dehumidifier to allow access for floor cleaning. The PD20DEN is fitted with castor wheels so can easily be moved across a room for this or any other reason. Please take the precaution of removing the water collection container first to avoid spillage. The Premiair PD20DEN is portable and is equipped with a top-mounted carrying handle for ease of transfer between rooms, particularly where a stairway has to be negotiated. At 13.7kg this is not an exceptionally light dehumidifier in its class but the weight will be easily manageable for most people. The PD20DEN should only be operated within a temperature range of 5°C to 35°C. At temperatures beyond this range the unit will not function correctly and may be damaged. This dehumidifier is not an ideal choice for use in areas with a low ambient temperature, such as a garage in winter, and will perform most effectively in living areas of the home where the temperature is maintained at a comfortable level for the occupants. The Premiair PD20DEN has an "auto-defrost" function which switches the compressor off when ice forms on the cold coil and suspends the refrigeration process. Once the ice has melted the compressor restarts and the dehumidifier resumes operation. In low ambient temperatures the defrosting time becomes excessive and most dehumidifiers are relatively ineffective. For low temperature operation a refrigerant dehumidifier fitted with an active defrosting feature to accelerate melting of the ice is required. Alternatively a desiccant dehumidifier may be used. The Premiair PD20DEN can remove moisture at a rate of 20 litres per day in warm, humid conditions of 30°C and 80% relative humidity. Most dehumidifiers are tested and rated in similar conditions but if you live in Northern Europe these conditions are rare. In "normal" conditions you can expect much less water to appear in the 3 litre capacity water collection container, which will only need emptying once, twice or, exceptionally, three times per day. If emptying the bucket is inconvenient, or simply an unwelcome chore, the PD20DEN can be set up for continuous drainage. The dehumidifier has a water outlet port in the rear of the unit, about half way from the top. This is closed with a rubber bung which can be removed to allow a drainage hose to be fitted. The hose is not supplied with the dehumidifier so must be purchased separately. The hose required should have an internal diameter of 12mm. The drainage feed is by gravity so the hose must be sloping down to the drain over it entire length and the drain may not be too far distant from the dehumidifier. It may be helpful, if continuous drainage is used, to place the dehumidifier on a surface raised above floor level. If an interruption in the electricity supply occurs the dehumidifier will switch itself back on to the programmed settings by means of its auto-restart feature. This refinement is not always included with home dehumidifiers and may be useful if the dehumidifier is being used while the home is unoccupied, or at night. The Premiair PD20DEN is equipped with an electronic control panel which makes it easier to use. With these controls the preferred fan speed may be selected. A high speed is perfect for laundry drying, for which the dehumidifier is effective due to a flow of dry air directed upwards. A lower fan speed allows quieter operation as the fan is the main source of noise from a dehumidifier. The adjustable humidistat is also controlled from the panel and may be set for your preferred level. When that level is reached the compressor switches off, saving energy, and only restarts if humidity rises again. A HEPA air filter is fitted as standard and carbon filters are available for purchase if preferred. The main disadvantage of this dehumidifier is the noise level. At 50dB it is not excessive for its capacity but there are quieter home dehumidifiers on the market. The unit would not be suitable for use in a bedroom occupied by light sleepers and would be more powerful than all but the very largest bedroom would require. Lower power home dehumidifiers tend to be quieter than more powerful models.